Zoffany was certainly paid handsomely for the work and to cover his stay in Florence (though the actual sum is disputed) however he never again worked for the Royal Family. The painting hung briefly at Kew Palace and is recorded, with The Academicians at the Upper Library at Buckingham House in 1819. A 'tribune' (tribuna in Italian) is the semicircular (or semi-polygonal) domed end of a basilican church; the Tribuna is the hexagonal domed room created in 1585-9 by Bernardo Buontalenti (1536-1608) at the Uffizi palace for the display of the masterpieces in the Medici collection. The idea of the space and the name was that the room (which originally had a single entrance) had the character of a chapel and formed a sort of Holy of Holies within the palace: indeed, it has remarkably similar shape and proportions to the much larger Capella dei Principi, Medicean funeral chapel begun in 1602, also with involvement of Buontalenti, next to the church of San Lorenzo in Florence. Both steep-domed hexagons are of course based on Brunelleschi's cupola of Florence cathedral, completed in 1436. It is perhaps not a coincidence that George III favourite architect, William Chambers, had recently created two octagonal temples to the Muses: the Great Room at the Society of Arts in 1759; and the Octagon, one of the four rooms housing the King's library at Buckingham House in 1766-7. It is tempting to suggest that Zoffany's painting was intended for the over-mantel space visible in Stephanoff's watercolour (Royal Collection), where the match of real and painted architecture would have been perfect. The Tribuna was presented in this period as Europe's most precious Wunderkammer, with a profusion of painting, sculpture, pietra dura and decorative arts, set against the already richly decorated surfaces of floor, walls and vault. In the words of Tobias Smollett (1721-71), 'there is such a profusion of curiosities in this celebrated museum ... that the imagination is bewildered . . . a stranger of a visionary turn would be apt to fancy himself in a palace of the fairies, raised and adorned with the power of enchantment' (Travels through France and Italy, letter 28, 5 February 1765). A comparison of Zoffany's view with the contemporary drawings of Giuseppe Magni (Gabinetto dei Disegni, Uffizi, Florence) reveals that Zoffany's is a substantially accurate record of the arrangement. There are two areas in which Zoffany has distorted or reinterpreted reality: he has adjusted the perspective of the interior; and he has taken liberties with the paintings he has chosen to include, often introducing works from the Pitti Palace or elsewhere in the Uffizi. Zoffany's viewpoint is slightly behind the centre of the room: (the central octagon of the floor pattern appears in the foreground). His field of vision includes a little less then three of the eight sections of the octagon, which would mean an angle of around 90 degrees. If he had carried this perspective through to its logical conclusion he would only have caught two of the four major sculptural groups placed in front of each alternate wall, instead of the four visible here. Moreover, almost all the objects and figures within the room, especially those in the foreground, should appear significantly larger than they do here: clearly if he had followed a geometrically literal regime he would never have been able to fit in so much or to have made so many interesting and intelligible groups. Instead, he has treated the 'floor-show' differently, adopting a perspective as if set in a cut-away model of the space, like a stage, and viewed from some way back in the auditorium. Evidently this aspect of the painting was also criticised: according again to Horace Mann 'they found great fault in the perspective which, they say, is all wrong. I know that he was sensible of it himself, and tried to get assistance to correct it; but it was found impossible, and he carried it away as it was' (letter to Horace Walpole, 10 December 1779). 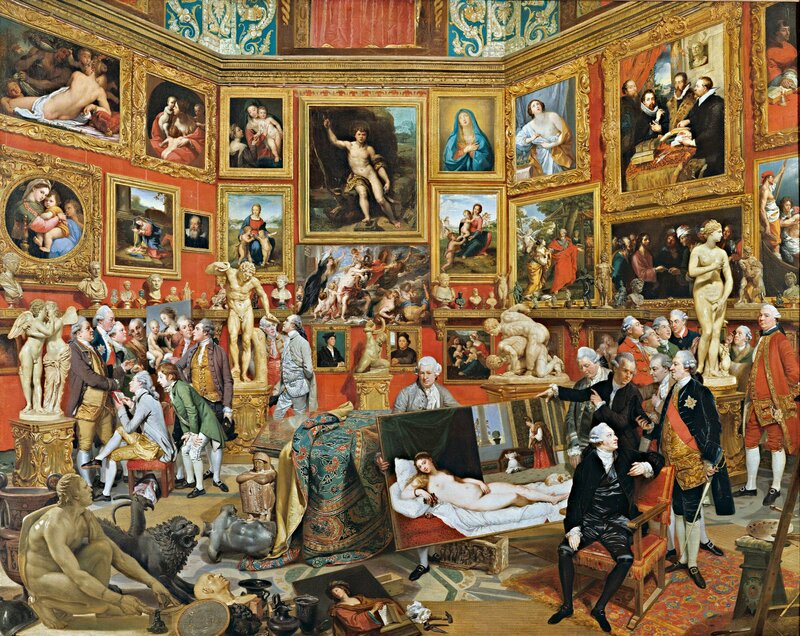 The art displayed here and its arrangement (by Zoffany as well as the custodians of the Uffizi) clearly has the potential to provoke innumerable conversations: Zoffany seems to be more interested in suggesting a multitude of ideas than in providing a coherent programme. The Royal Academy catalogue of 1780 described the work as a 'room in a gallery of Florence, called the Tribuna, in which the principal part is calculated to show the different styles of the several masters'. Zoffany not only imitates their styles, he arranges them so that the relationships between them can be appreciated. The great tradition of painting is dominated by 'the divine' Raphael, his figure of St John the Baptist 'pointing upwards' as if to suggest a heavenly source of inspiration. The same tradition is maintained through the reverend Bolognese school of Annibale Carracci (1560-1609) and Guido Reni (1575-1640), and the occasional Flemish artist such as Rubens. Zoffany invites us to play the familiar game of comparing painting and sculpture, ancient and modern: who is the most beautiful woman of all? Clearly Venus, but is it the modern painted Venus of Urbino or the antique sculpted Medici Venus? There is also some nationalism present: the Etruscan remains stress them importance of Tuscany; the Holbein portrait tries to bring England into the story. For the last two hundred years Zoffany's Tribuna has been hung near to his Academicians (Royal Collection), and there is evidence that they were originally conceived as a pair. They make a very effective contrast between creating and appreciating art; between back and front of house; the former with the dark, thinly painted character of a work-in-progress, the latter with the highest and more precious finish. Only two vignettes within the Tribuna tell of the labour of art: the easel, palette, knife, brushes and maul-stick at the right margin and the hammer, pliers and pile of nails in the centre. Zoffany evidently feels that all these grand tourists should learn how to stretch a canvas. The Interior of the Grand Duke's Gallery at Florence.